N o, I’m not talking about football. Do you remember a time when you woke up knowing that later in the day you would be competing in a major event? Or maybe it was a performance or interview? Can you remember those feelings? The nervous energy. The butterflies. The edge. The pressure of an audience, a rival, or a desired outcome. What did you do to prepare? How did you cope with the stress and pressure? For most of us, those days of a concentrated edge have melted into routine. Routine presentations. Routine meetings. Routine trials. Routine surgeries. Routine performances. Routine competitions with little to nothing at stake. Routine days filled with patterns, conversations, paths, and scenery that make time fly by in unmarked monotony. We even cope with routine pressures: money, kids, family, deadlines…repeat. The truth is that most of us prefer to avoid the concentrated pressure of those game day butterflies. Routine feels so much safer. Less risk. Less to lose. Less pain. The problem with a game, performance, or high stakes encounter is that it presents an opportunity to lose. Why would we step into a place where we might fail? The truth is that most of us prefer to avoid the concentrated pressure of those game day butterflies. Like it or not, failure is always around the corner. Regardless of how you prepare for or approach your days, they WILL give you an opportunity to fail. Think about it, we even make failure routine. We fail our spouses. We fail at work. We fail on the road. Every single day, we fail in the mistakes we make. They are completely unavoidable. They come along with that human nature we receive at birth. Though we work hard to avoid mistakes, they are always waiting, lurking in the shadows – waiting to spring upon us. The reality is that every day is game day. Today is game day. The butterflies may be gone but you show up, prepared or not, to fail or succeed in the performance of your life. Sure, we view it as routine but in those patterns of steadiness appear opportunities to impact the world around you. Your life, and every single day of it, presents opportunities for you to be a force for better…or for worse. There is no sitting this game out. You may choose to put a little or a lot of effort into it but, God willing, you will be playing it for a long time. Knowing that, why not approach it with a bit of that youthful energy you once displayed for a Little League game, or school play, or dance recital, or spelling be? What might happen if you woke up every day with one or two butterflies in your tummy as you considered how you might make a difference sometime over the next 16 hours? There is no sitting this game out. You may choose to put a little or a lot of effort into it but, God willing, you will be playing it for a long time. No, not everything in our day will be high stakes. Thank goodness! But our days bring us the chance to perform. How will we prepare? How will we approach those opportunities? We choose our attitude. We choose our focus. We can even choose our enthusiasm and energy. Each day, the choices await you. Will you choose to embrace the tension and wade into the moments of impact? Or will you choose to skate through another day avoiding as many pressure points as possible? Today, consider how you will perform. Game day gives us the opportunity to be our best, to execute at our highest level. Rather than easing into the comfortable path worn by walking safely among known terrain, push yourself onto the field and experience the bright lights of pressure and anticipation. Challenge yourself to win in whatever way has meaning for you. Embrace the tension and know you’ve still got it – the power to be the star of your own performance. Remind yourself that every day is game day. 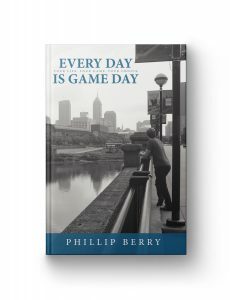 Every Day is Game Day: Your Life. Your Game. Your Choice.